Traditional "beautify" the "rust resistant" based on the plating, multi-function, high performance, value-added focus to reliability, we are working actively to protect the global environment yet. With concideration to the whole line, the right surface preparation contrubutes to successful processing, Therefore, OKUNO-AUROMEX supplies a wide range of cleaners for electoplating and industrial use, as well as surface preparation for different kinds of substrates. For example, OKUNO-AUROMEX supplies spray and soak cleaners for different kinds of metals, electrocleaners for steel, zinc, brass, and aluminium cleaners, deoxidisers, etc. 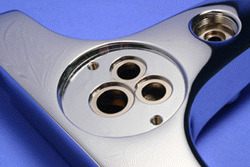 We support nickel and chrome processes pm different kinds of substrates. sicj as steel, zinc, brass and aluminium, etc. is a durable pollyurethane coating system which provides high hydrostatic resistance(mullens), moisture vapor transfer(MVT) amd tapeability. We have over ten years' experience in supplying electrophretic processes and equipent, such as ultra filtration systems for jewelry, hardware, eye ware and building products industries. 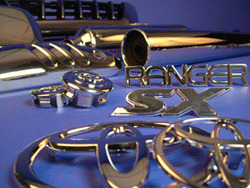 we provide moplete and varied processes with advanced plating techniques to add value to final apperance, such as nickel free, gold/silver plating, titanium, rhodium, platinum and pure tin/tin lead. We are also one of the leading providers of gold(24K & 18K)and silver electroforming for jewelry and gift items in Asia. 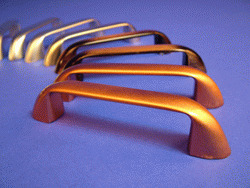 Plastic are plated for the purpose of saving weight. As automotive companies develop more fuel-efficient vehicles, the demand for lightweight materials increses. Top Metalate Process will enhance the appearance of products, and give long-lating corrosion protetion, effective solutions both economically and ecologically.